Mother’s Day – Special! • Run Hard. Rest Well. 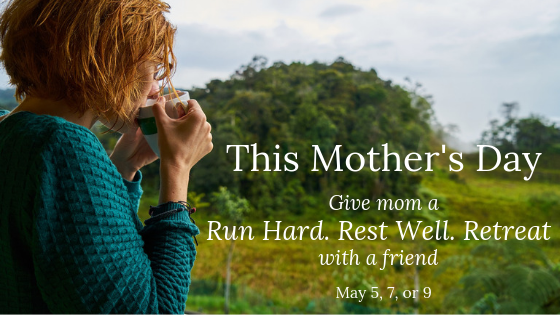 This Mother’s Day we are celebrating the blessings of “quiet time off the beaten path” by offering a “2-for-1” giveaway for a woman you love who would enjoy an opportunity to slip away and catch her breath. To learn more about these retreats click here. To register, sign up for 1 retreat at the $69 rate. In the space for notes/comments include that this is a Mother’s Day Gift. We will email a code for a FREE retreat for a second person to participate and a gift certificate for you to share. If you want to send a group of 4, 6, or 8 women, email us. We can send you an invoice. If you have questions, please contact us at rhrwteam@gmail.com Happy Mother’s Day! Let’s make this the best one yet.